Rakesh Jhunjhunwala, 59, India’s most successful equity investor who made 3 Billion dollars (300 crores USD) starting from $100. Rakesh Jhunjhunwala is a wise man with uncommon Intelligence. He is one of the most popular and respected equity investor of India. He manages his own equity portfolio as a partner in asset management firm Rare Enterprises. The name of his asset management firm is given from first two initials from his name Rakesh Jhunjhunwala and his wife name Rekha Jhunjhunwala. Rakesh Jhunjhunwala was from middle class family his father was income tax officer. He started trading in 1985 when BSE Sensex was 150. He selected stock market trading as a full-time profession. For him “making money from the stock market is child’s play”. You can read about Rakesh Jhunjhunwala biography from here. Fan and follower of Rakesh Jhunjhunwala always seek information about buying and selling activity of him. In order to help them here is a comprehensive list of Stocks held by Rakesh Junjhunwala, Rekha Jhunjhunwala of Rare Enterprise Equity: Last update April 2019. Rakesh Jhunjhunwala’s portfolio is consisting of 27 different stocks. Total value of his portfolio is around INR 19960 Cr. Top stocks holding by him is Titan, Lupin and CRISIL. He holds 804.66 Lakh shares of Titan worth 6456 Cr. He owns 78.83 Lakh shares of Lupin worth 645 Cr. At the third position, he is holding 40 Lakh CRISIL shares worth 762 Cr. In addition to above stocks he is also holding other stocks such as A2Z Maintenance and Engineering, Adinath Exim Resources, Aptech, Aurobindo Pharma,Geometric,Rallis India,SpiceJet,Viceroy Hotels,Jet Airways,Mandhana Retail Ventures,TV18 and Adlabs Entertainment. Holding details and amount of share is not known. Rakesh Jhunjhunwala Favorite stock Titan is losing its sheen.Titan Q1 net dips 15% to Rs 151cr. Jewellery sale sink by 11%. Titan is down by 5%. Rakesh Jhunjhunwala said some time back that e-commerce boom would burst sooner or later, But a recent bumper profit of amazon is proving him wrong. Mr Jhunjhunwala, his wife Rekha Jhunjhunwala, and their company Rare Enterprises together have bought a total of 6.25 lakh shares of Escorts from the open market on August 6th,2015. Rakesh Jhunjhunwala recently purchased 2.24% equity share of Intellect Design. As per latest share holding pattern he has also increased stack in Polaris Consulting, a parent company of Intellect, to 4.99 percent from 4.74 percent during the quarter. Rakesh Jhunjhunwala buys 1.05% in Jet Airways – Rakesh Jhunjhunwala’s RARE Enterprises acquired 11.95 Lakhs shares or 1.05 percent stake in the private airline. The shares were bought at an average price of Rs 422.76, valuing the transaction at Rs 50.52 crore. Following the transaction, shares of Jet Airways surged by 11.28 % on the NSE. Next Mediaworks is latest stock pick by Jhunjhunwala. He has invested 35 Cr in Next Radio subsidery of Next Mediaworks. Jhunjhunwala has picked up 7 lakh shares in IT training firm Aptech. He is holding 45.28% stake in this company. In September 2016, 3.5 Lac shares of Adlabs Entertainment was purchased by Rare Enterprise at 81.86 Rs. Jhunjhunwala filed application of Rs.750 Cr under ICICI Prudential Insurance IPO and got share of 27 Cr. On 16th Dec,2016 RJ buys 12.74% in Mandhana Retail Ventures that hold exclusive license to manufacture and sell Salman Khan’s “Being Human” brand cloths. 42.3 Lakh shares of Intellect Design Arena was sold by Jhunjhunwala at average price of Rs.120. Ace Investor Rakesh Jhunjhunwala has picked up 1.03% Shares of Jaiprakash Associates and 1.26% shares of Jubilant Life in June,2017. Jhunjhunwala buys 10 Lakh shares of Prakash Industries via Block Deals on 24th Aug,2017. Rekha Jhunjhunwala buys 45 Lakh shares of Forties Healthcare on 22nd Aug,2017. Jhunjhunwala increases stake to 1.64% in Prakash Industries. Jhunjhunwala invests 180 Cr in gaming firm Nazara Technologies. It is not listed firm. However, it is expected to list next year. Recently Jhunjhunwala has increased stake in Lupin by 1.92% in Jan,2018. In Feb,2018 he has purchased additional 10 lakh shares of the airline company SpiceJet. Jhunjhunwala’s Rare Enterprise bought 3 Cr worth share of J P Associates as per bulk deal data on NSE at 15th March,2018. He has sold 1.4% stake in Titan around 1.25 Crore shares in May- June 2018. Rakesh Jhunjhunwala has raised 0.83% stake in Jaiprakash Associates during April to June Quarter. Jhunjhunwala increased its stake in DHFL by 43 basis points in the quarter ending September 2018. Junjhunwala raised his stake in TV18 Broadcast by 0.4 percent by purchasing an additional 62.5 lakh shares of the firm. The ace investor also raised his stake in pharma firm Jubilant Life Sciences during the last quarter. 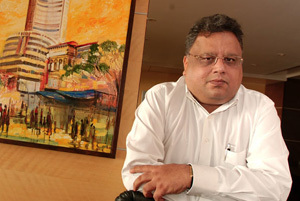 Rakesh Jhunjhunwala has raised stake in 4 companies Aptech, NCC, Federal Bank and Jubilant Life Sciences. He reduced the stake in Titan, TV18 Broadcast, Karur Vysya Bank & Lupin. Jhunjhunwala Net worth is increased by 30 Crore USD compared to March 2019. Rakesh Jhunjhunwala has increased stake in First Source Solutions in the January 2019 to March 2019 Quarter. Note – Above information is collected from BSE site and various other public domain. This information is nearly accurate. However, it may vary with actual investments. « Should you buy property via real estate website? Why one should know what Mr.Rakesh Sir is holding , please read his “Biography”, try to learn from it. Start with small amount , only planning on paper will not help you, Stock market is go/play/experience/earn. I would suggest to sell Reliance communication shares. As I could not see any future in the Stock.